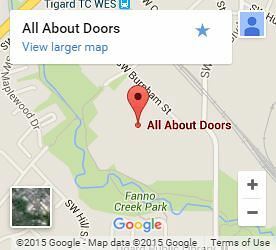 When it comes to garage doors, Wilsonville relies on All About Doors. We’ve been providing complete local garage door service for over 25 years. As an industry leader we understand the importance of providing services for garage doors Wilsonville trusts. Standing behind our work means doing what’s right for the customer. That means no unnecessary or aggressive upsells. Our employees don’t receive commission. This empowers them to help you to the best of their ability without worrying about the bottom line. Get reliable service from a garage door company built on providing the best service and products. For garage doors. Wilsonville residents benefit from a company that can do it all. We provide full service for all garage door makes and models. Tune-ups – Tune-ups keep your garage door functioning properly. We advise a tune-up at least every 2 years. This involves a full inspection that identifies damaged or worn components. Catching problems before they start saves you time, money, and major inconvenience. Repair – Damage that compromises the security of your garage door needs professional repairs. Vandalism, break-in attempts, weather damage and more can compromise your garage doors ability to protect you. Our technicians perform thorough diagnoses. These identify damage that may not be entirely visible. Our repairs restore your door, and its protection. Customer safety is one of our highest concerns. Garage door spring replacement requires a professional. Amateurs have been maimed and even killed when they accidentally released the force these springs contain. We’re fast, efficient, and we keep you safe. Installation – When they want new garage doors, Wilsonville residents don’t always know where to begin. We can help. We perform complete installation and replacements for commercial properties and homes. We’ll help you find the right aesthetic for your home and identify your usage needs. We schedule services around you so it’s never inconvenient. All work on your Wilsonville garage doors is tested and guaranteed. When you need garage doors in Wilsonville, let us provide you with incredible service and quality that spans decades. Call (503) 620-2453 or Contact Us today.